Meeting writers and editors in person who I only knew through blogging and social media such as, Allison K Williams (read my post about her amazing book, Get Published in Literary Magazines) and Kim Brown, aka The Confident Writer, who is also the Founder and Editor of Minerva Rising Press and Donna Talarico, the founder and editor of Hippocampus Magazine that will be publishing an essay of mine in March. Getting great advice. Like, if you get a personal rejection, be grateful. A personal rejection means your work was read and considered. Don’t follow up on that personal rejection, though, by asking for more feedback. Editors are too busy for that. (Whoops.) Also, wait three days before emailing the editor you met at the bar. I got this piece of advice just in time. Otherwise overeager, stalker-Teri would have emailed the editor seconds after returning to my hotel room. SO GREAT TO MEET YOU!!!! #willyoupublishme? The chance to pass out the super cute cards you made on MOO.com with your contact info and blog address. AWP discounts that help you subscribe to new journals such as Under the Gum Tree, Fourth Genre, Kenyon Review, and Rock & Sling. I also subscribed to the Journal of the Month to familiarize myself with new journals. Inspiring readings that give you the itch to write. A few hours to write in a quiet hotel room. 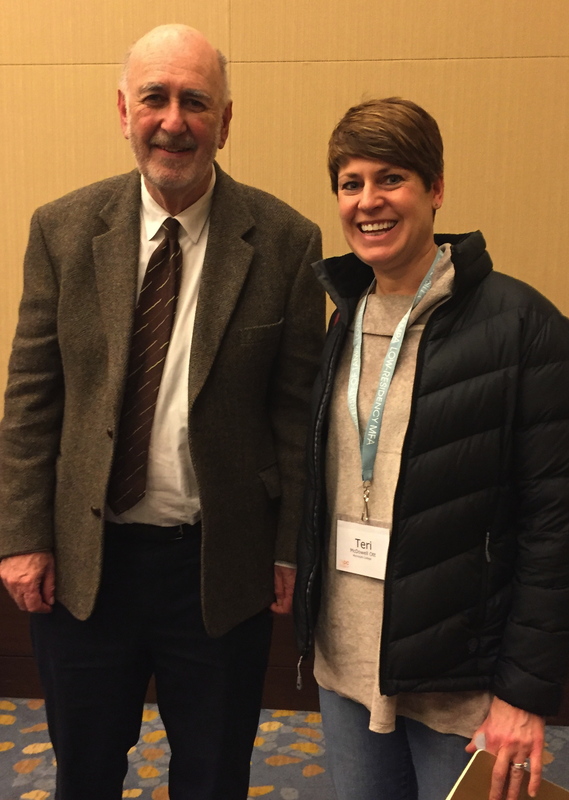 The chance to get your picture taken with Phillip Lopate. ← What can the church learn from a Starbucks barista?